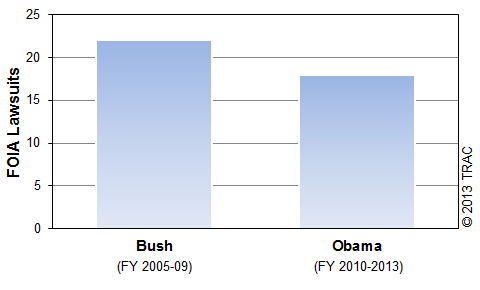 The decline does not seem to be related to a drop-off in the problem of government secrecy because, as noted in a recent FOIA Project study, the total number of FOIA lawsuits brought by all kinds of plaintiffs during the Obama administration’s first term was higher than in the last term of President Bush. An alternative interpretation is an increasing interest by a range of different FOIA users and a decreasing interest by the news business. A range of different reasons are offered for the decline. “Newsroom budgets have been slashed so it is no surprise that there is less time to pursue freedom of information litigation and less willingness to put time into stories where government may delay responding for long beyond the statutory limits,” said David Cay Johnston, now president of Investigative Reporters and Editors. – Covers all lawsuits filed from October 1, 2004 to March 1, 2013 whose “nature of suit” was classified by federal courts as a Freedom of Information Act lawsuit. – Media counts are based on a manual search among the plaintiffs for media organizations. All large print, broadcast and online media groups were searched by name. In addition, a lengthy list of words that often appear within media organization names was searched to identify plaintiffs with those words in their name. Almost as noticeable as those on the list of most active media in this area were the well-known news groups who were absent. They included USA Today, the Wall Street Journal [note], McClatchy Newspapers, Reuters, Time, Newsweek, ABC, CBS and NBC. Also missing were new media organizations such as the Huffington Post. But, as suggested above, FOIA requests for information on matters other than individual files were much rarer: amounting to only 1,545 of the total. Thus, relative to this much smaller number, the total of 233 requests submitted by media organizations suggests the media during the past two years for this one agency were relatively active. – Covers request-by-request information from ICE files released to FOIAproject.org in response to FOIA requests for augmented logs on all FOIA decisions made by ICE during the preceeding month.